A single molecule experiment investigates the properties of individual molecules. More recently, single-molecule fluorescence is the subject of intense interest for biological imaging, to study single, labelled biomolecules in-vivo in cells. The photobleaching rates of 13 fluorescent dyes (see below), 4 of them conjugated to trolox, were investigated for single-molecule measurements at 37oC in living cells. For this purpose they were linked to a tag protein that was fused to CD47. 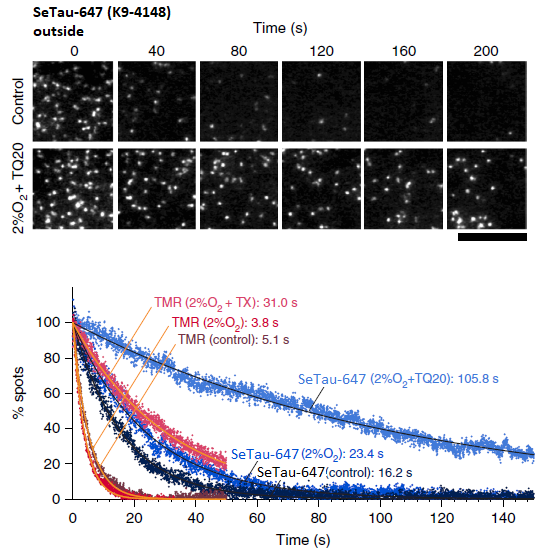 In this study SeTau-647 (K9-4149 and K9-4148), a squaraine rotaxane dye, exhibited the best photobleaching performance with an exponential lifetime of 105.8 sec and the best localization precision with 21.5 nm. As a membrane-impermeable dye it allowed for the observation of up to 12,000 frames, which is the longest single-fluorescent-molecule tracking ever reported (see images below and paper in Nature Chem. Biol. ). and Cy5-Tx) under controlled conditions and conditions for slowest photobleaching . 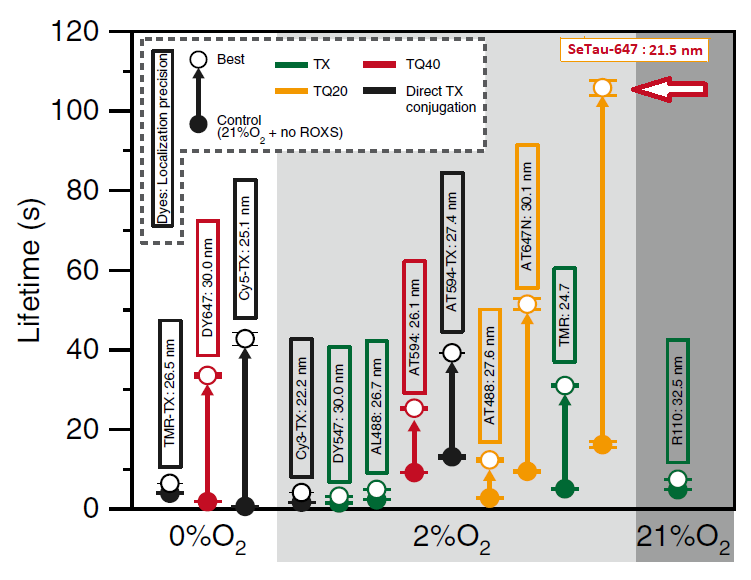 Most dyes including SeTau-647 (arrow) exhibited the longest photobleaching time at 2%O2. of 105.8 sec and the best localization precision with 21.5 nm. (fluorophore is located on the outer surface of a T24 epithelial cell). frame for TMR and SeTau-647 (K9-4148) on the extracellular surface (bottom) . Our cyanine-based dyes are more photostable compared to the conventional Cy dyes and Seta-555, Seta-650 and Seta-750 exhibit even higher photostability compared to Alexa dyes and are therefore are better suited for single molecule measurements. Some of our Seta dyes e.g. Seta-670-NHS show extremely low blinking effects at the single molecule level and high photostability . These labels exhibit easy conjugation chemistry and are available in both NHS and maleimide forms. Below is an example of a single molecule application that was done with Seta-670-NHS and a commercially available antibody. Fluorescence resonance energy transfer (FRET) is used to obtain distance information from 10 to 100 Ǻ, a range suitable for studying the global structure and interactions of biomolecules. Nevertheless, some conformational changes are difficult to detect using ensemble FRET. The development of single-molecule spectroscopy makes it possible to probe the conformational dynamics and interactions of biological systems at single-molecule level. To date the most popular fluorescent reporter molecules for single molecule studies are still small size organic molecules. Among them SeTau-647 is currently the dye with the longest exponential lifetime of 105.8 sec. Besides small size and brightness an ideal fluorescent reporter for single-molecule studies should exhibit good photostability and a low tendency for aggregation including easy conjugation chemistry. FRET pairs should also have an adequate shift between the donor and acceptor emissions and similar brightness . Seta-670-NHS has a significant overlap integral between its absorption and emission spectra. Its Förster distance (R0) for homo-FRET was calculated to be about 50 A, a distance comparable to the size of the antibody. The homo-FRET is expected to occur already when an antibody is labeled with only two fluorophores and increases quickly with the number of labels. Analysis of single molecule traces shows an interesting behavior where efficient non-radiative excitation energy transfer and self-quenching already manifests itself with only 2 or 3 labels. Detailed analyses of the overall and average residence times reveal that multiple labeling with fluorophores, such as Seta-670-NHS, could be a good approach for increasing the number of available photons and extending the overall observation time to study/observe binding at the single antibody level. Intrinsically, the signal and lifetime of the individual, intermediate fluorescently labeled species strongly depend on the number of labels, but the average residence time for each single species is similar. Apparently due to energy transfer the change in fluorescence intensity is compensated by the change in average fluorescence lifetime. Contrary to ensemble measurements where over-labeling is commonly recognized as a problem, this approach appears to have significant advantages for single antibody (protein) studies . For additional FRET pairs we refer you to FRET applications, where we provide a more comprehensive list of donors and acceptors including the calculated Förster distances.